I've finished Autumn in my Garden! I'm very pleased with it. Lisa and Nicole are making that top too and we thought it would be fun to reveal our finishes the same day, so you'll just have to wait for our Sunflower Sisters Parade another day or two, or week or two, until we're all done . Since I can't share that fall quilt with you I thought I would share my fall quilts that I got out this past weekend. I didn't get this quilt out, I put it up, but I didn't share it with you the first of September. This is Route 44, one of my top ten all time favorite quilts. I replaced Route 44 with Hallowe'en 1904! This is also in my top ten all time favorite quilt list. Technically it's a little big for that space, but I wanted to hang it this year, next year I'll put it on the bed. If you look real close you can see Eat More Pie in the mirror. I also got out Olde World Stars and folded it to showcase the green stars to go with the green fall decor in that room. 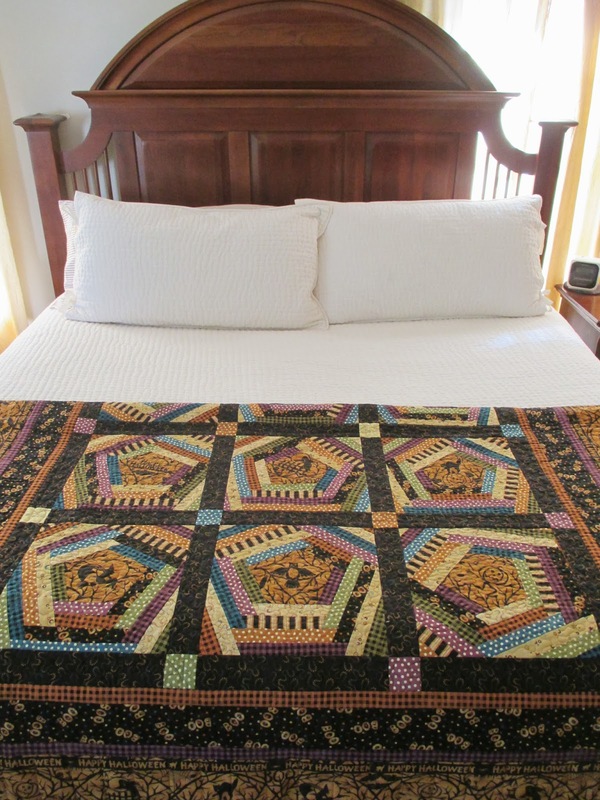 I had this bargello quilt on my bed the month of September. 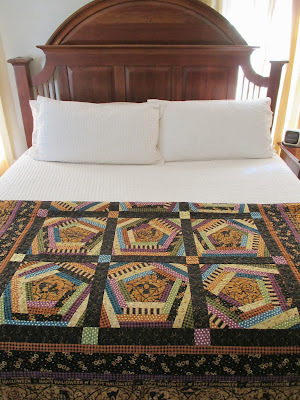 I was a little nervous about having it on the bed, it's my only hand quilted quilt, but it survived just fine. Now I have this Halloween quilt on the bed. Long Road Home and State of Grace are now on the red couches. And Father's Fancy is folded in the TV stand. Myths of Avalon, Settlers Trail, Stars Above my Red Chateau, and Jake are on the quilt ladder. 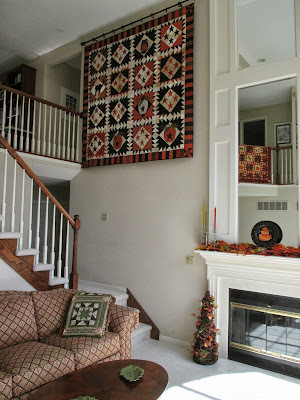 I have more fall quilts in the family room, I'll share those another day. I seem to have more fall colored quilts than any others, I need to get going on those happy fabric colors so I'll be equally set for spring and summer! I really like the Halloween quilt. You have such a good place to display it. What a wonderful quilty house to enjoy! Thanks for sharing. Each and every one is beautiful. It would be hard to pick favorites. Happy Autumn! I love this post! Thanks for the wonderful show and great ideas as to how display quilts. 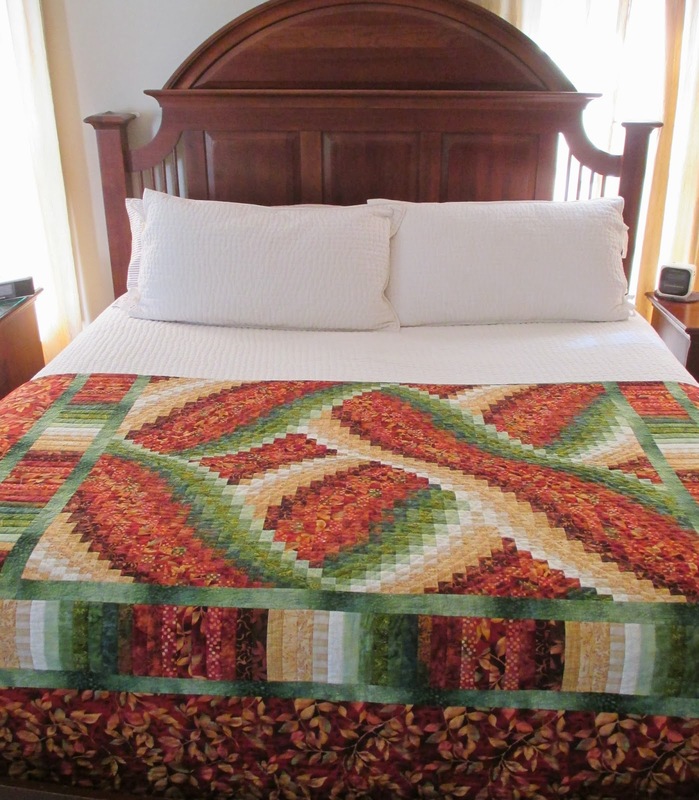 Beautiful fall quilts! I enjoyed the tour. Lovely! wow! I really enjoyed seeing all the beautiful quilts you have made. I don't know how you punch them out so fast. Your work is beautiful. Thanks for sharing. They are all beauties, Thelma. All gorgeous! But I don't see the fantastic one with the Halloween stitcheries that you completed not long ago (sometime during the summer). That one needs to be out there somewhere too. I love all your quilts - but the Halloween one is to die for! So glad you hung it up. Looks great. Seeing your Route 44 makes me want to get going. I have all the blocks done - just need to assemble. I'm making mine out of French General fabrics and LOVE it, don't know why I've put it away for so long! Thanks for the inspiration! You have graciously invited us into your home and I love it! I don't do much decorating except for Christmas but you have me thinking of getting started with Fall projects for future decorating. Your quilts look so beautiful in your home! Your quilts are all so beautiful. WOW! I'd love to come by and just pet your quilts!!! They are all beautiful! Loved the tour. 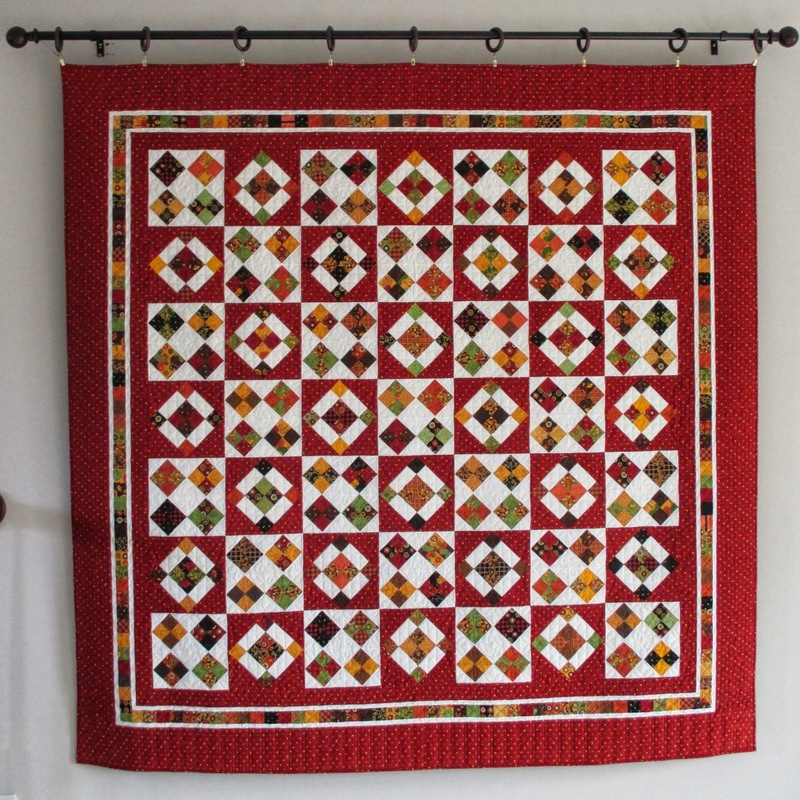 Your quilts are beautiful and show off the season. What great eye candy! 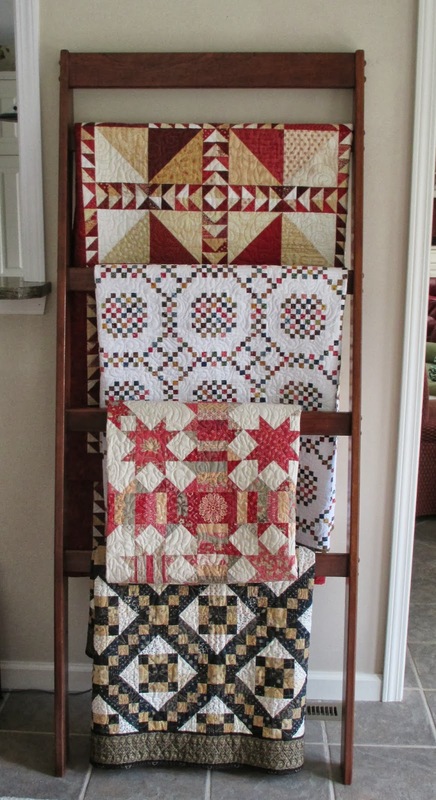 Love seeing your you display your fall quilts! Wondering what pattern you used for your Happy Halloween quilt. 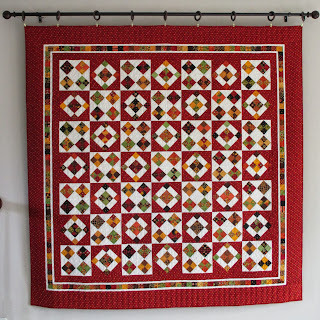 There is a link to click on in your first 100 quilts, but it takes me to the wrong quilt. I'm looking forward to seeing the Sunflower Sisters Parade! 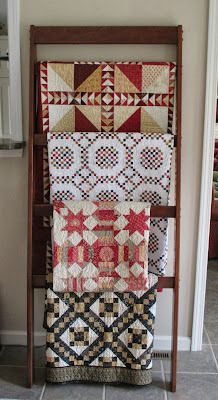 I love to see how quilters decorate with quilts. Beautiful display; thanks for sharing. Beautiful quilts, and such a neat house!! !